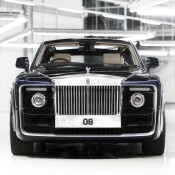 What you are looking at,ladies and gents, could be the most expensive new car the world has ever seen. 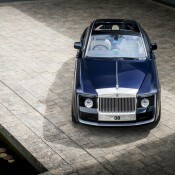 It’s the one-off Rolls-Royce SwepTail, built over a period of four years for one individual who has reportedly spent $13 million on it. If we had spent that kind of money and the car we got looked so… weird, we’d be calling our personal ninjas to go and make some heads roll! 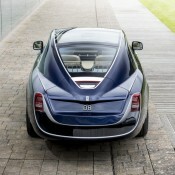 But hey, the guy who ordered this Rolls-Royce SwepTail must have liked these unusual looks – the design is nod to the swept-tail of certain Rolls-Royces from the 1920s, admired by the client – because RR designers made sure that every last detail of the vehicle was built to his specifications. They, for instance, spent a lot of time putting in a full glass roof since the dude was adamant he needed one. The client may be rich, but he doesn’t seem to have many friends, since he asked for only two seats in this huge car, and we reckon one of them will always be empty. The design of the interior is excellent, though, with a minimalist approach that is such a joy even to look at what with today’s cluttered and button-festooned car interiors. The choice of colors is equally dear, with dark and light, Ebony and Paldao, set off by contrasting light Moccasin and Dark Spice leathers that adorn the seats, armrests and dashboard top. 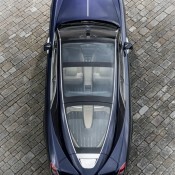 Behind the occupants, a feature named the Passarelle flows from the rear edge of the windscreen to resolve in a teardrop as it connects to the hat shelf to join all interior volumes. This element also includes the only visible presence of this singular motor car’s name as ‘Sweptail’ is discreetly debossed into the surface, exactly on the centre line. 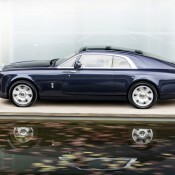 The post Rolls-Royce SwepTail – $13 Million Coachbuilt Dream appeared first on Motorward.